Hypertrichosis syndrome is a medical problem that causes hair to grow unrestrained in places that does not usually grow any hair. Hypertrichosis is different from hirsutism, which is a condition that causes hair to grow thick and dark in areas of the body usually reserved for men. Hypertrichosis may affect the whole body or only certain places. People can be born with this medical condition (congenital) or it can be acquired any time during one's lifetime. Congenital hypertrichosis is a very rare condition. In fact, the condition is so rare, only 50 cases of congenital hypertrichosis have been verified since the Middle Ages. So how does congenital hypertrichosis happen exactly? A fine layer of uncolored hair referred to as "lanugo" typically covers a developing fetus. On the eighth month of pregnancy, this hair should fall off and replaced by "vellus" (body hair), as well as scalp hair. However, in very rare cases, the lanugo hair does not fall off and instead it continues to grow. Instead of vellus hair, lanugo hair remains on the body after birth. The lanugo hair continues to grown until the individual dies. Congenital hypertrichosis has a couple of variations: congenital hypertrichosis terminalis and naevoid hypertrichosis. The former is a condition wherein the lanugo hair turns into a dark color, making the afflicted individual resemble a werewolf or an ape man. The latter variation of congenital hypertrichosis is a condition wherein only one area of the body has excessive hair. Naevoid hypertrichosis is not always congenital; it can occur after birth. Acquired hypertrichosis develops after birth, regardless of how old a person is. Acquired hypertrichosis is manifested by the presence of transparent vellus hair or colored terminal hair. The whole body or just one area may be covered by this hair. The cause of hypertrichosis still remains unknown. 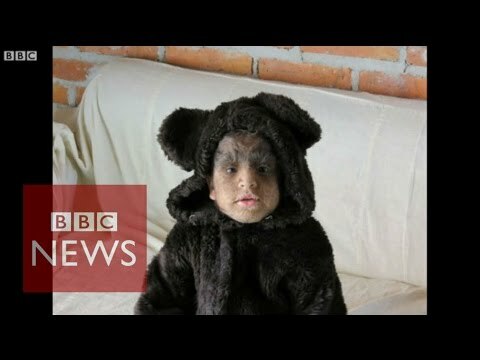 However, there is speculation that hypertrichosis is a genetic disorder that is either passed down or is simply the result of genes spontaneously mutating. However, it has been observed that people with acquired hypertrichosis lanuginosa are diagnosed with cancer later on. This cancer-associated growth happens mostly on the face, eyelid and nose areas. Scientists think that hypertrichosis might be the result of metabolic disorders, as well as medications like oral phenytoin and cidosporin. Using a razor to remove the hair and avoid stubble. Using depilatories or hair removal creams, which should be applied only after completing a skin test to see if there is any unpleasant reaction. Using bleaching agents to help make the hair disappear. Undergoing an electrolysis treatment, which sends small electric charges right to the hair follicle to deaden it, or a laser treatment, which uses laser beam to kill hair follicles. Electrolysis and laser are rather expensive hair removal treatments. Only trained professionals should administer these treatments. Skin discoloration, rash and scarring are some of the known side effects of electrolysis and laser hair removal treatments. There are many home electrolysis kits on the market, but be aware that they are not effective at removing hair. People who suffer from hypertrichosis would have to either try any of the hair removal techniques available or simply live with their condition as is. This is because no drug has been created to treat hypertrichosis.